Contest is over! Thank you to all the participants. Winners will be announced tomorrow!!!! A big thank you to Shirley Broback for the opportunity to host a giveaway to their annual baby fair which is being held in Victoria B.C. at the Pearkes Recreation Centre on Saturday September 28th from 10am to 5pm and Sunday September 29th from 10am to 4pm. The Vancouver Island Baby Fair is produced by Laughing Belly Productions, a family-run business based on Vancouver Island. They produce the largest events on Vancouver Island dedicated to expectant & new parents, their babies, young children and the families and friends that love them. 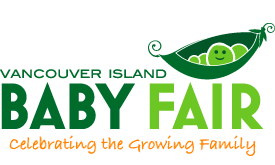 Providing an unparalleled marketing opportunity for businesses and organizations geared to pregnancy through preschool, Vancouver Island Baby Fair aims to create a fun, educational and family-friendly experience. They are committed to support local community initiatives at each event and have partnered with organizations like Child Find BC,Success by 6, Nanaimo Child Development Centre, Foster Parent Support Services Society, Haven Society, Greater Victoria Down Syndrome Society, 1Up Victoria Single Parents Resource Centre, and Young Parents Support Network. Shirley Broback is a proud mother of two, and the Producer of the Vancouver Island Baby Fair. With a background in event planning, marketing, sales & management, as well as the perinatal field, Shirley combined her passion, experience and skills together to create the Vancouver Island Baby Fair. She earned the distinction of being named the 2009 SavvyMom Mom Entrepreneur of the Year by Savvymom.ca, and supports other local mom-entrepreneurs through speaking engagements and mentorship. Shirley is also the host and producer of the Real Parenting radio show on CFAX 1070, Saturdays at 12pm PT. So , without further ado, I am giving away TWO PAIRS OF WEEKEND PASSES TO THE VANCOUVER ISLAND BABY FAIR!! Just click on the link below to enter! Good luck! Winners will announced on September 27th! You have until the 26th to enter. Click me to enter my giveaway! Only one person in your household may enter. Each winner will receive two weekend passes to the Vancouver Island Baby Fair. Weekend Passes are tickets to attend the Vancouver Island Baby Fair on both dates and times stated above. When commenting on this post, please leave your name and email. Contestants who are not members of Livejournal.com will be listed as "anonymous" unless you enter your name and email address. Contestants must be able to pick up their tickets in Nanaimo, B.C. - NO shipping is available. (Sorry!). Once winners receive their passes, I, Claudia, am no longer responsible of any passes if they are lost, stolen, or destroyed in any form or under any circumstances. There will no refund or no replacement of tickets. (Again, sorry!). Nor Shirley Broback, Vancouver Island Baby Fair are related or responsible for this giveaway. They gifted me the weekend passes. I, Claudia, decided to host a giveaway. stop hurting our unborn child!